Prior to booking this course, we recommend calling our office (02) 4782 2014 to ensure that this course is appropriate for you. Climbing at the “sharp end” is the ultimate vertical experience! As a budding climber the time will arrive when you feel you are ready to cast off the top ropes and learn to become a lead climber. The decisions you now make could be the most important ones of your whole climbing career! The ASM Traditional Lead Climbing Course is an excellent introduction to the specialised art of lead climbing. 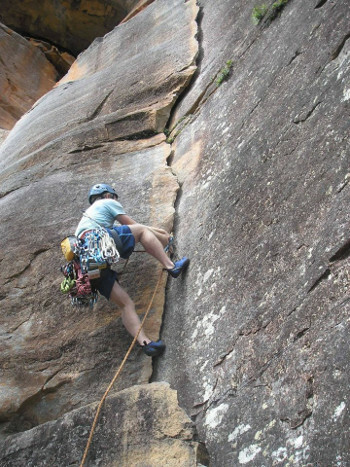 This course will get you well on your way to becoming an all-round, self-sufficient climber. Our three-day lead-climbing course will teach the aspiring lead climber the skills required for safe, efficient lead climbing. Operate belay devices in "guide mode"
Course participants will learn while they climb and they can look forward to leading a number of selected classic climbs under the close supervision of their instructors. Experience lead climbing indoors or outdoors advantageous but not necessary!